The other night I watched the documentary, Banking on Bitcoin. It is a 5-star documentary by Christopher Cannucciari on how the blockchain technology had irreversibly changed the concept of a monetary system in the world. Prior to the launch of the Bitcoin and its many derivatives, all monetary and banking systems had been centralized and government-backed. The lack of confidence engendered after the economic fall-out of 2008 caused a societal reconsideration of the underlying confidence in the traditional economic system. With the blockchain-based innovation known as Bitcoin, there was a new non-centralized, self-policing, distributed ledger book that had the implicit trust of the broader distributed community because of the mathematical and non-repudiation characteristics of a distributed architecture. It was a virtual (no pun intended) renaissance of trust between and among traditionally quasi-hostile trading partners. It represented a true revolution in the banking system that reflected, in part, a populist trend that soon began to manifest politically, as well as economically. I had been thinking all day about the work of Ayn Rand and her endless quest for the real John Galt; her character of the perfect man. So, when I watched this documentary it triggered some reflections of how Rand’s philosophy of “Objectivism” has embedded itself in modern society. My take on what has been happening in the political sphere in late 2017 is that we are going through a populist re-boot of Rand’s philosophy; I will call it Objectivism 2.0. For those of you familiar with the work of Rand, the moniker of John Galt as he was presented in her fictional book “Atlas Shrugged” is one of an ideal person – self-sufficient, ethical, reliable – in short, all the traits of perfectionism rolled into one. As her story develops what emerges is an archetypal image that one “should” strive to become. 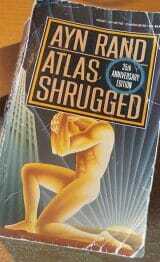 John Galt becomes an almost Superman-like archetype in her depiction. But, for those of you not familiar with Rand’s work, you will not have witnessed her dripping Chekhovian-like drama of the battle between socialist idealism and individualistic narcissism. Nor will you have seen her characterization of the divisive personifications of evil versus good in her uni-dimensional portrayals of corrupt bureaucrats versus esteemed individualists. Her philosophical viewpoints, as portrayed through her fictional characters, tell a story of the challenges this John Galt character must endure in his quest to create a perfect world. Fast forward to 2017 and the popularity of Bitcoin and other virtual currencies based on distributed ledgers for a virtual monetary system that does not rely on a single authority. In Rand’s book the manifestation of perfection also had a place. It was known as Galt’s Gulch. In our modern world, for those that are advocates of virtual currencies, the place has become a collection of zero’s and one’s all across the Internet; this distributed ledger. There are many John Galts, all seeking to maximize their own individual goals and objectives by using blockchain technology. Its application to Bitcoin and various other currencies could be described as a demonstration project. But currencies are not the only potential of the blockchain technology. Now, take this notion of a distributed “ledger-like” authority and apply it to a distributed ecosystem of network defenders and cyber threat analysts that are working together to counter the criminal enterprises that are corrupting the ideal of the Internet. This distributed blockchain-based ledger can become the clearinghouse for cyber threat intelligence (CTI). And, as more and more John Galts adopt, use, and participate in the system, it becomes more and more refined, accurate, and ultimately, predictive. But for a CTI Blockchain framework to emerge it must have an underlying widely-accepted data model. For those of you familiar with my work, you’ll know that I strongly believe that the Structured Threat Information Exchange (STIX) 2.x ecosystem is going to provide the basis for advanced sharing of CTI. This is the data model that all of the John Galts will speak. The yet-to-emerge CTI Blockchain will become the most effective weapon civilized society can muster; a distributed ledger counter-offensive measure. For those wanting to participate in the emergence of this new social/cultural/technical experiment it will require that we all learn the language and build on it. And, like STIX 2.x, the Trusted Automated Exchange for Indicator Information (TAXII) 2.x will play a fundamental role in the build-out of the new ecosystem. I’m not sure at this point how this will emerge, from a technological point-of-view; but an analogy might be that TAXII 2.x becomes the “Galt’s Gulch” as the transport for this distributed CTI Blockchain architecture. But where is the societal connective tissue? Who will create the blockchain-based algorithm that will frame the distributed ledger? How will it be socialized? With Bitcoin and various other blockchain technologies for currency replacements it was the criminal enterprise that provided the motivation and impetus for rapid adoption. With the new CTI Blockchain we will need to depend on the recognition by innovators and pioneers that this is an opportunity waiting for expression. Efforts to stifle that innovation, for what ever reasons, run counter to the overall objective of widespread adoption. Who will it be that leads this innovation? This question I leave to you, John Galt.